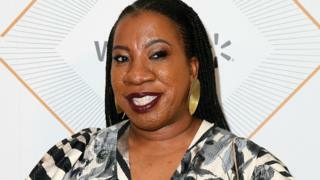 Image caption Tarana Burke: "Whether they do something for the Oscars or not doesn't matter to me"
The founder of Me Too says she doesn't mind if stars don't wear black on the red carpet at this weekend's Oscars - because the movement isn't a "gimmick". Guests at the Academy Awards are not expected to replicate the blackout seen at the Golden Globes in January. Rights activist Tarana Burke said the key was helping survivors of assault. Speaking at the Essence Black Women in Hollywood luncheon ahead of the 90th Academy Awards on Sunday, she told the BBC: "We have real work to do." Burke was the first to use the phrase "Me Too" as the name for her activist group to help those who had been sexually harassed and assaulted. It transformed into the #MeToo hashtag last year in the wake of the Hollywood sexual harassment scandal, and subsequently a broader movement. Leaders of the Time's Up movement, which has emerged to counteract abuse and inequality, told US media on Thursday there would be no co-ordinated red carpet protest on Sunday. Instead, they said they had worked with the Academy of Motion Picture Arts and Sciences to plan "a moment" during the ceremony to reflect the campaign. Burke added: "What happened at the Golden Globes was a unique action to an issue that affects people from around the world. "It's not a gimmick. We have real work to do, making sure survivors have what they need to have to heal. Whether they do something for the Oscars or not doesn't matter to me." Speaking about the impact Me Too has had, she said: "It's still a little bit overwhelming but I'm definitely humbled by all of this attention. "I don't really have use for celebrity myself but as far as it elevates this platform and allows me the space to speak about sexual violence to people, then I'm deeply appreciative of that." How did #MeToo shape the Oscar nominations? The 11th annual Black Women in Hollywood event, organised by Essence magazine, honoured four actresses - Tiffany Haddish, Lena Waithe, Danai Gurira and Tessa Thompson. Ava DuVernay, Lupita Nyong'o and Janelle Monae were among those walking the event's black carpet. The cast of horror film Get Out, which is nominated for four Oscars, including best picture and best director for Jordan Peele, were also there. Betty Gabriel, who stars as maid Georgina, said: "I'm a little biased but it's made a big impact. I think it's so unique and well done. "It has such great vision, it's insane. It speaks to something that we're all aware of but don't really address. We all get something out of the film." Asked whether the industry is changing, she said: "I think so. I think it has changed and that's continuing. It's ongoing." She's going to the Oscars, along with the rest of the cast of Get Out. "It feels pretty cool. I'm looking forward to hanging out with Meryl Streep," Gabriel laughed. She said she'd love Daniel Kaluuya to win best actor for his role as Chris, a man who gets trapped in a nightmare when he meets his girlfriend's family. Gabriel said of his role: "He breaks your heart. It breaks it wide open." Lil Rel Howery, who stars as Chris's friend Rod Williams, said of the film's success: "It's surreal. When you go around Hollywood and see all these posters... I had to park my car when I saw this huge billboard with Daniel with the tears. I had to pull over and stare at it." He said there has never been a better time to be black in Hollywood. "It's such a good time to be a writer, to be a producer, to be black - unapologetic, not afraid to tell our stories. I'm proud of Jordan Peele to have the courage to tell such a crazy story. "I'm so excited about the Oscars. I'm going to have this moment of looking around." And as for Kaluuya's chances? "Daniel's my friend - I think he's got a great chance. He deserves it."